Welcome to the process of wedding cakes. A part in contributing to the overall experience of a personalised dream wedding. The Ranunculus, a ball like flower in vibrant colours, available in various sizes, is currently a popular flower for weddings and wedding cakes. This is for a wedding cake sometime in December last year. I made it in shades by colouring the paste as I go. It looks good among the bouquet of roses, peony and hydrengea. Below is a tutorial on my version of this flower. I used the teardrop cutter in various sizes. To make the centre you will need an 18 gauge wire, loop it at the end. A small teardrop cutter and gumpaste ball rolled slightly more that half the size of the cutter. Use the piping tip no.12 and 4 to make circles, and a knife or blade for the lines. Cut out some petals using the same small teardrop cutter that you measured the ball with. This is done by placing the ball too half on the petal, half on the sponge. Use the same motion as thinning the edges, but this time, place the ball tool completely inside the petal. Attach them to the ball. Overlap the previous petal as you attach a new one. I used a total of 5 petals to complete a circle. Continue until you find that the petal is too small. This picture is just before I changed to the next cutter size. It is also time to give it a stronger support. This is Wilton's flower former, the smaller size. After more layers and another 2 changes in cutter size, a change in ball tool size (to a bigger one) and a change to the bigger flower former. This is the biggest I could go. Notice that the edges started to frill? For it not to frill, a bigger sized ball tool will do the trick. A total of 3 ball tool sizes has been used for this particular flower. Making the ranunculus gives understanding to the workings of a ball tool. An easy but time consuming flower to make. What I like most are the colours...fun colours! Thanks for sharing the useful information. 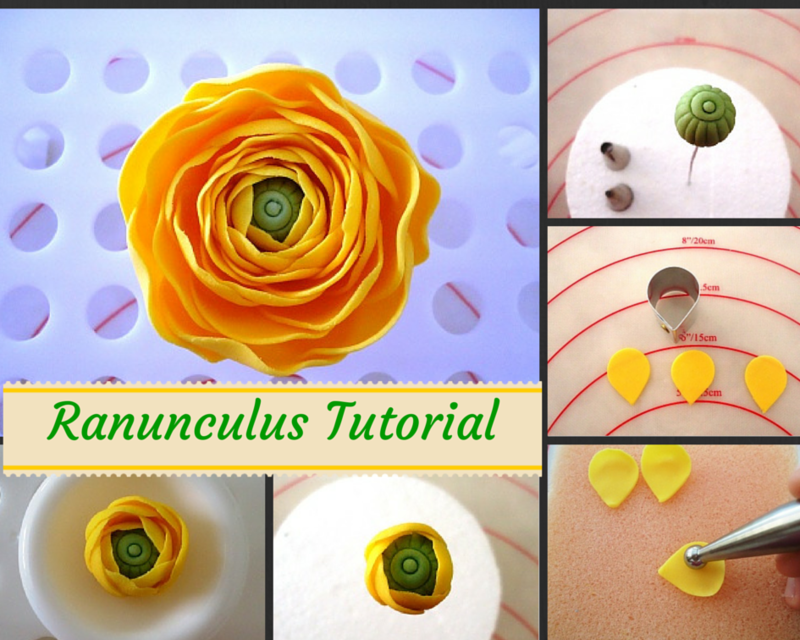 Love your Rununculus!!!! Here a link to their online shop. It's a Japanese kitchen ware shop. Hi Nurainie!! Thanks for the tutorial beautiful flowers! Thank you so much for this post. A bride just asked me to make this flower for her wedding cake, and this tutorial is helping me out a lot. So pretty! Hi nuraine, aru you using the size cutter, thank you for sharing the tutorial. I use teardrop cutters in various sizes. You are welcome!